Take these delicious and healthful tips for cooking from a true baliboosta. Today’s best cooks pride themselves in using locally-grown produce and cooking from scratch. But Fadila Shamo David and Rivka Alcobi, mother and daughter born in Mosul, Iraq, came from a time and place in which nearly everything was hand-made and locally sourced. I guess you can say Iraqi grandmas were the original Brooklyn hipsters… or something like that. 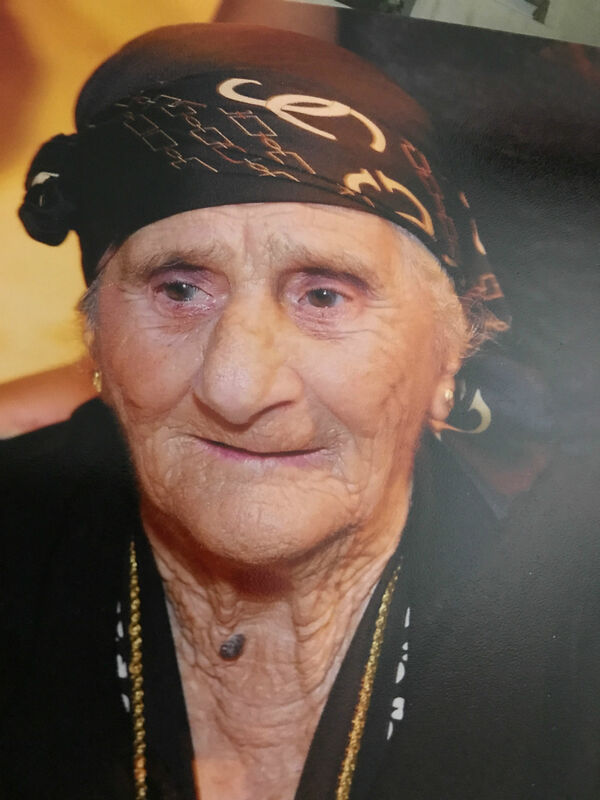 Fadila was born in Mosul, Iraq in 1914 and her daughter, Rivka, in 1939. Rivka has many memories of life in Iraq and the food they ate there. There were strong food traditions and there was abundance. However, when they were forced to flee Iraq as refugees in 1950 to Israel, the country was not yet the thriving farmland it is today. In fact, there was great hunger and the new immigrants had to make do with very little. 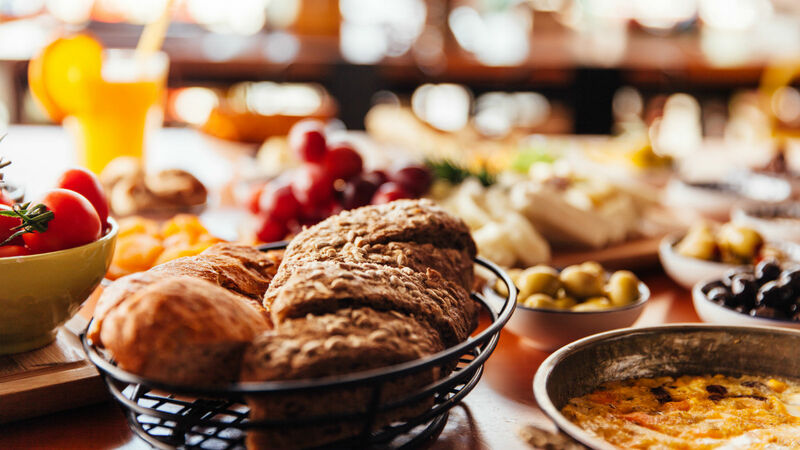 Today, Rivka revels in the abundance of fruits, vegetables, grains, and meats in Israel, and relishes cooking as a connection to her mother and the life she was forced to leave behind in Iraq. Rivka, and her children Asher Alcobi and Merav Gavrielov, spoke to me about the secrets of Iraqi cuisine, tips that are as old as the centuries-long Jewish community of Mosul yet sound surprisingly current given today’s emphasis on food that is local, simple, and fresh. Mosul, north of Baghdad, in northern Iraq, is a sun-filled place. Fadila Shamo David used the sun liberally in her food preparation. She made tomato paste, a staple of Iraqi cuisine, by cubing tomatoes, mixing them with salt, squeezing them by hand through a large-holed colander, and spreading the resulting skinless tomatoes on a large tray, to be heated and dried in the sun until a tomato paste resulted. She also used the sun to make apricot sun jam — soft, ripe fruit that was mixed with sugar, then left to cook in the sun until a sweet, intensely flavored jam was left behind. So much of getting the best flavor out of vegetables includes reducing the amount of water in the produce. When Fadila would remove extra water from the vegetables, she would do so by using her hands — not with knives or any sort of equipment. She squeezed the extra fluid out of onions or cabbage or tomatoes by squeezing those vegetables with her own two hands. To reduce the strong flavor and odor of onions, Fadila would soak them in salt and water and then squeeze the water out of the onions by hand. The resulting onion is milder and less pungent than raw onions. And when making red cabbage slaw, a side dish traditionally enjoyed with sabich, Fadila and Rivka would also use their hands for mixing. One of the rules of Iraqi cooking is simple: do not waste. For the slow-cooked Shabbat dish, t’beet (an Iraqi version of the Ashkenazi cholent), which consists of chicken and rice, ground beef, tomatoes, herbs, and spices, Rivka and her mother would skin the chicken and then stuff the skin with a mixture of rice, beef, onions, and home-made, sun-cooked tomato paste. Once the chicken skin was stuffed and sewn closed, they would place it in the pot in which the t’beet would be cooked. Then they would stuff the skinned chicken with the same rice and beef mixture. Nothing would go to waste. Fadila’s diet was consistent and simple every day: Her mid-day meal was black coffee, toasted rye bread, raw tahini, and and sometimes a natural sweetener like sun jam, honey, or silan. Dinner was cubed watermelon and bread. She died at close to 100 years old, so the proof is in the pudding. To make silan, a date honey, she would boil fresh dates in water until soft, place the softened dates in a cloth bag and then, by hand, squeeze. Out came the thick sweet silan, or date honey. It was simple, sweet, and healthy. Meat is tasty, and it is special. Rivka remembers eating it on Shabbat and holidays, but not for every meal. After all, who needs meat when in Iraq — and Israel — the melons are large, juicy, and lush, and the markets are filled with the freshest produce. Rivka spoke lovingly of the fresh yogurt and white cheeses they would buy every morning in Mosul, made from the milk of Iraqi buffalo. 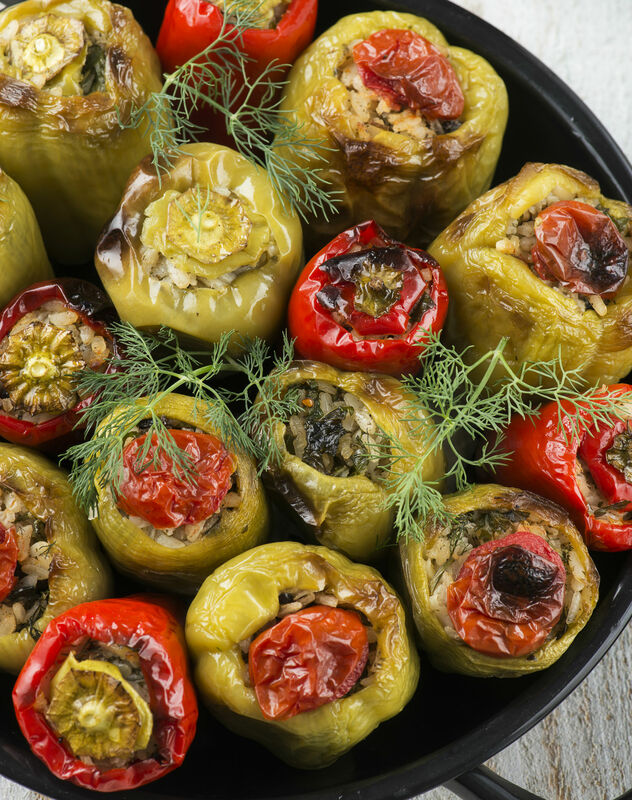 Stuffed vegetables are a regular part of Iraqi cuisine and while you could stuff the vegetables with ground meat, doing without is also delicious. Rivka fills a pot with layers of stuffed vegetables, starting with stuffed onion leaves, topped with stuffed small zucchini, and then covered with stuffed grape leaves. At times she would randomly place stuffed tomatoes between the other vegetables. The three layers of vegetables would be cooked in a bath of sun-made tomato paste, water, lemon, salt, pepper, and oil, and cooked in a covered pot for 1 ½ – 2 hours. The stuffing? Rice, tomato paste, pepper, salt, and chopped onions. Mejadarah (mujaderra) is another meat-free favorite in both Syria and Iraq. We may think that eating and buying local produce is a new idea, but it is as old as time. When Fadila grilled meats, she used the wood of local trees to give the kebabs their best flavor. Lemons and oranges were ubiquitous in Mosul. The wood of citrus trees was considered the best wood to use when grilling meats, for their light and sweet flavor. This is Rivka Alcobi’s apricot sun jam recipe, as told by her daughter, Merav Gavrielov. Wash and pit fresh, soft, ripe apricots. Weigh apricots and mix them with half their weight of sugar. So, if you have 2 pounds of pitted apricots, use 1 pound of sugar. Cook the sugar and apricots on a low heat on top of the stove, until the sugar melts. Do not let sugar brown or burn. This should take less than five minutes. Spread fruit/sugar mixture in large, rimmed sheet pan. Place pan holding the fruit inside a larger pan. Place both pans outside, in the sun. Pour water into the larger pan, forming a moat around the smaller pan holding the fruit. By placing the fruit filled pan inside another pan filled with water, you protect the fruit from ants that may try to encroach on the fruit spread. Cover fruit pan loosely with cheesecloth to protect the fruit from bees and other insects. Keep the fruit pan in direct, hot sun until it thickens to a jam-like consistency. If it has not thickened over the course of one day, bring the pans inside at nightfall, and bring the pans outside the following day until the fruit has reached desired thickness. Depending on the heat of the sun and the quantity of fruit you use, this may take between 2 – 7 days. Get ready to fall in love with this Iraqi comfort food.